Adventurous food usually goes along with adventurous travel, and my most recent adventure was no exception. On a typically gorgeous October morning in Aspen, complete with robin-egg blue sky and yellow leaves falling like snow, my friend Michael and I set off on foot for the 11-mile hike over West Maroon Pass into Crested Butte. Michael was a Peace Corps volunteer in Nepal in the early 1970’s, and as we headed toward the pass I peppered him with questions about Nepalese trekking and the food I’d need to nourish my body up and over 17,000-foot passes. Typical tourist fare in the ‘teahouses’ built to house and feed Westerners consists primarily of daal bhaat (lentils and rice), chiya (we call it chai) and saag, my favorite Himalayan dish. When you think of saag, you likely call to mind the rich, creamy spinach dish served with rice and naan. It turns out saag is loosely translated as “chopped leafy green vegetables” and is traditionally made with either mustard greens, chard, bok choy, or spinach and typically without cream. I learned this at Crested Butte’s Sherpa Café, where the saag was divine, but according to Michael, “Westernized”. As Michael chatted comfortably in Nepali to our host, my mind wandered….would I dig the saag in Nepal if it were mustardy-bitter and creamless? Upon my return to Boulder, I set out to find the best-tasting spinach saag (and the inseparable accompaniment, naan) in Boulder. Here’s what I found at visits this week to Sherpa’s Kitchen (downtown), Jai Ho (28th & Walnut), and The Taj (South Boulder). I first trekked on down to Sherpa’s Kitchen, located in a lovely old house with cozy, warm rooms that beckon on a fall or winter day. I ordered the saag dip appetizer ($5.95) and naan stuffed with onion and cheese ($3.95). The saag was not spicy (some would argue it was bland), but I liked that it was very light on cream and the spinach tasted “al dente” fresh. This saag will likely appeal to the calorie- or dairy-conscious (tip: you can also request it dairy-free with soy milk). The naan was quite tasty, and a four-piece order is included with the appetizer. My curiosity was peaked and inspired me to continue my adventure. Next stop? Jai Ho, a few doors north of REI and recommended by two friends, one married to an Indian man. Delicious aromas wafted from the kitchen as I took in the lovely décor—mood lighting, dark orange walls with designer sconces, and fancy table settings. Jai Ho marries the cuisines of North and South India, and my kind server confirmed that cream appears in Southern Indian saag but typically not in the North. 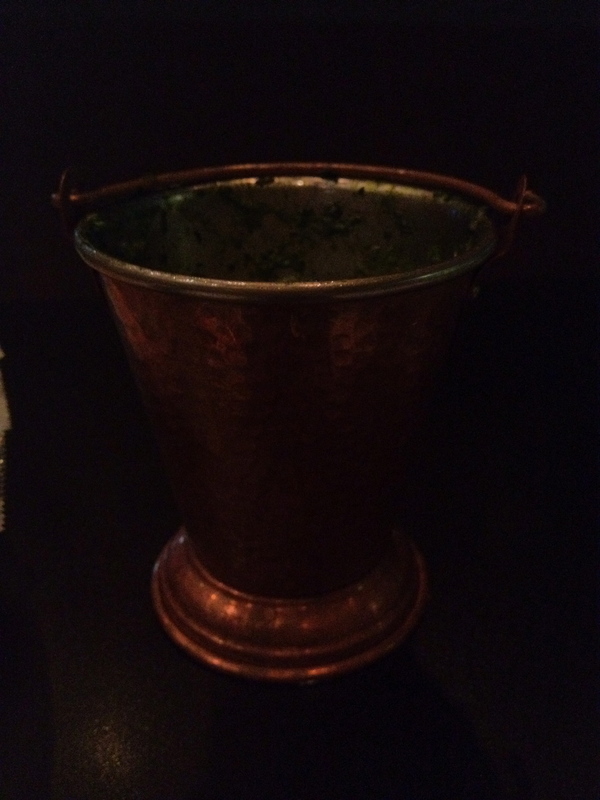 My saag dish was presented in a lovely copper chalice, and was much creamier and spicier than that at Sherpa’s. My server amusedly informed me it was not spicy by Indian standards. Jai Ho’s recipe includes jeera powder (cumin), coriander, garam masala, salt, and butter. The cheese-stuffed naan ($3.95, enough for two) was possibly the most exquisite, moan-worthy naan I’ve ever eaten. Flaky, thick, rich, and filled with a thin layer of cheese…I can still taste its pillowy goodness. 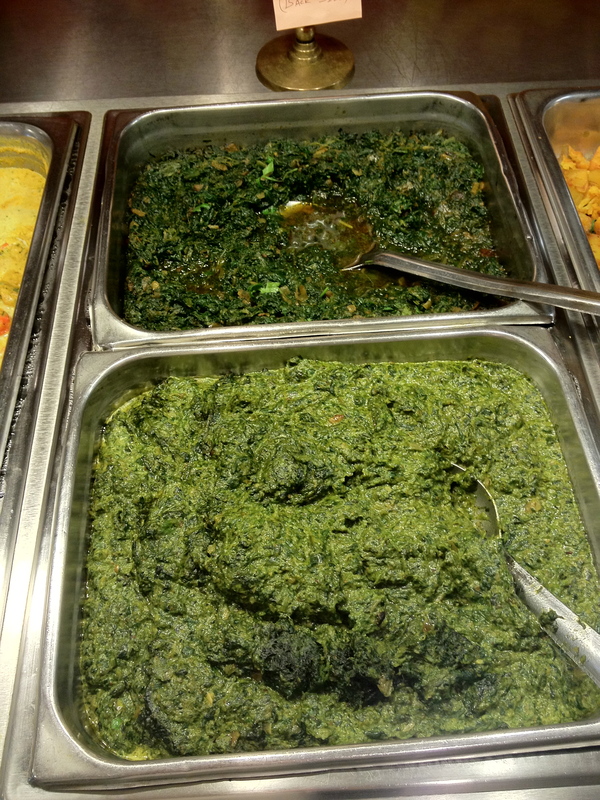 Wishing I had time to visit Tandoori Grill, Bombay Bistro, Himalayas, Curry ‘n Kabob, and others, I finished my saag roundup at The Taj restaurant’s $9.95 lunch buffet in the Basemar Shopping Center. The dairy-free crowd will appreciate the cream-free version; it was dense with large pieces of spinach and sautéed onion, flavored with nice spices and ghee (clarified butter). I did enjoy the creamy version more, and both versions set off my spicy radar (I had to reach for bread to tame my fiery taste buds). Important tip for buffet goers: wait for fresh naan to appear since the last piece in the warmer was dry, tough, and lifeless, and a bit too sweet for my taste. The freshly baked naan was soft and semi-puffy, though taste-wise, not worthy of gorging on. For the gluten-free among you, rice is your friend. Saag and rice make perfect plate- and palate-mates. So that concludes our local Himalayan adventure! Here are some rankings (in order of ‘favorite’ to ‘least favorite’) to guide you next time you’re planning a trek, hankering for some iron, or craving a healthy, filling, budget-friendly meal. Take some friends and feel free to comment below – we’d love to hear YOUR favorites! Great article, Elizabeth! My stomach is growling!